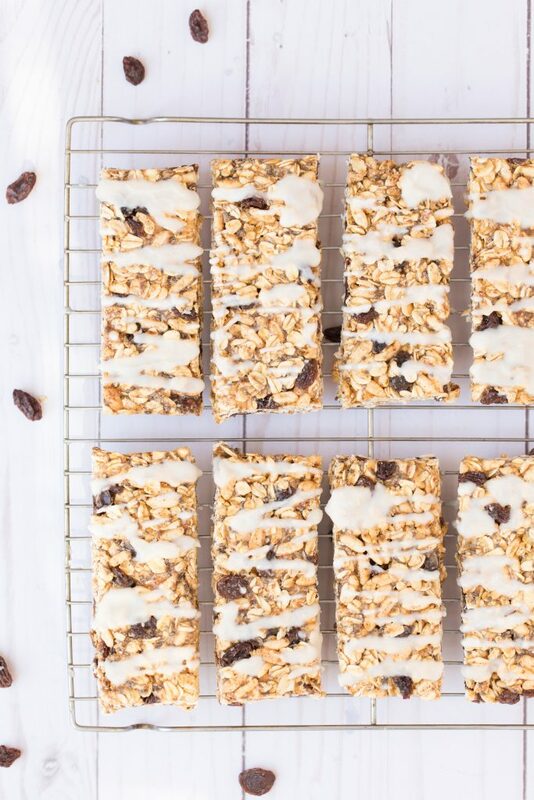 Iced Oatmeal Raisin Granola Bars – Chewy and studded with raisins, these homemade granola bars have all the flavors of the classic oatmeal cookie! While there are a lot of healthy granola/energy bars on the market these days (so many flavors! so convenient! ), I think homemade granola bars taste best. 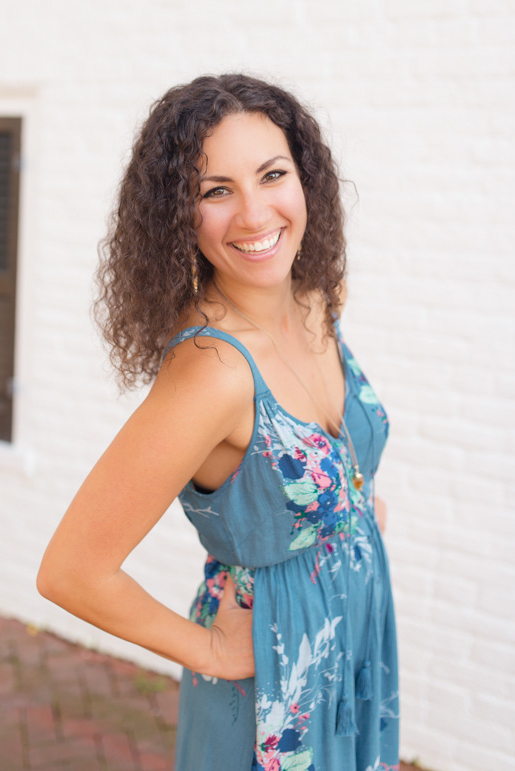 Plus, like anything you make at home, you’re in control of the ingredients, which can equate to a better-for-you bar! 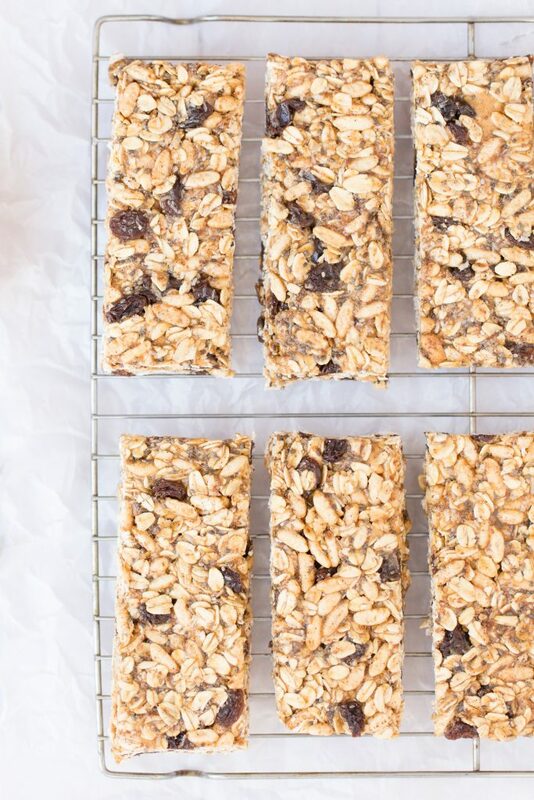 Homemade granola bars are also a big money saver, since some brands cost up to $3 per bar! Yowl – that’s a snack that really adds up. 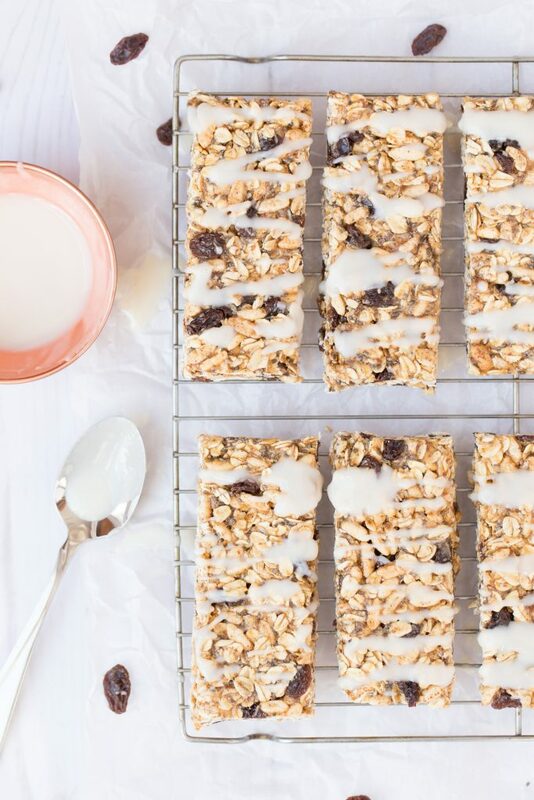 Here, I took my favorite flavors from oatmeal cookies and turned them into a raw bar perfect for on-the-go breakfasts and snacks. 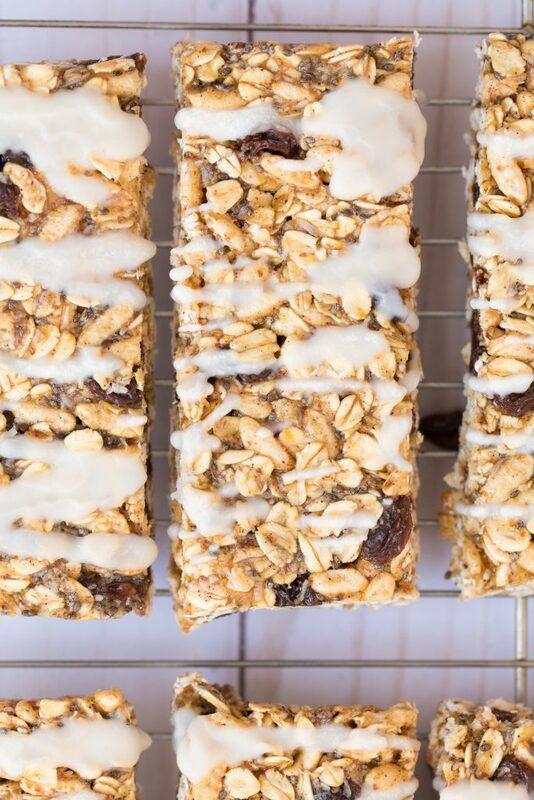 You can stop here, but if you think the granola bars are looking a little plain at this point, you’re going to want to melt some coconut butter and drizzle all over the tops of your granola bars. 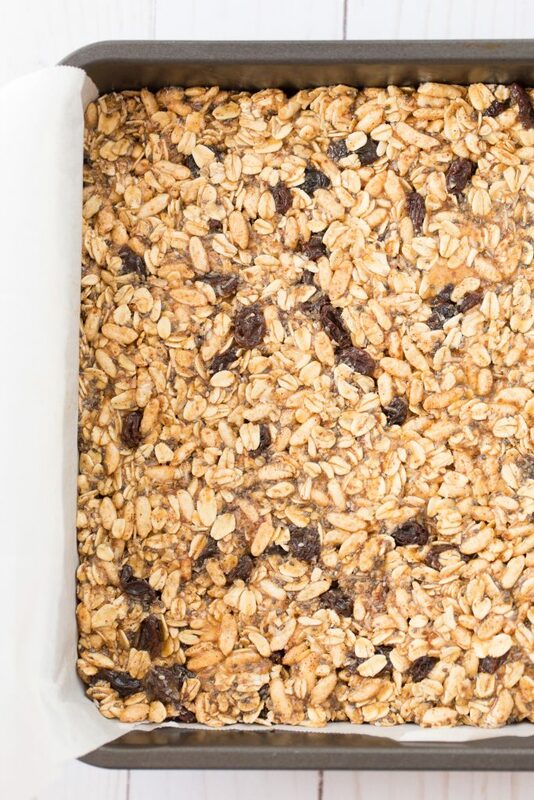 If you like more protein in your granola bars, try adding a few scoops of collagen powder to the mix! In a medium mixing bowl, combine oats, rice cereal, raisins, chia seeds, flax, sea salt, and cinnamon. Set aside. In a small saucepan set over medium heat, combine rice syrup and peanut butter. Heat until melted and pourable, about 5 minutes. Remove from heat and stir in vanilla extract. Pour peanut butter mixture over oat mixture, quickly stirring to evenly combine. Use a spatula to scrape sides of bowl if needed. Press mixture into parchment lined pan. With wet hands, lightly press the top to ensure an even, compact layer. Refrigerate 15-30 minutes till firm, then lift parchment from pan and cut square in half, then cut in rows to equal 10 bars. 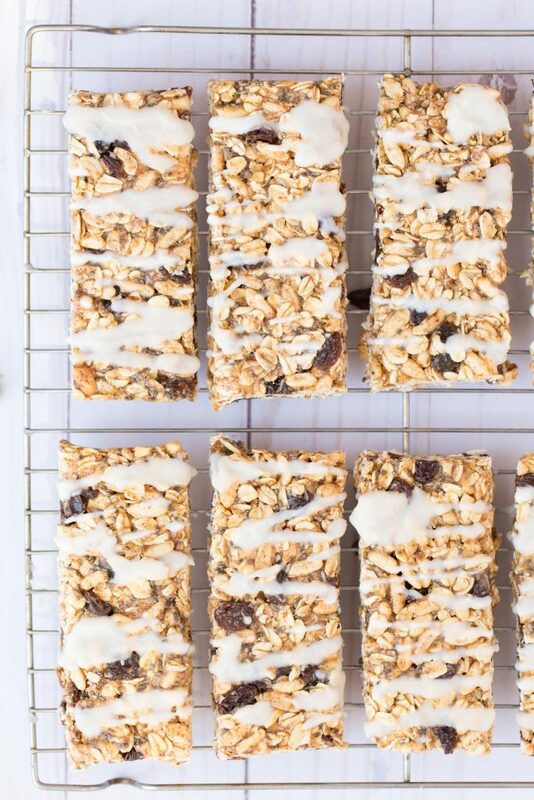 Melt coconut butter and drizzle over the tops of granola bars. Store in airtight container up to 1 week. Can also keep in the fridge and let sit at room temperature for 10 minutes before eating. When measuring brown rice syrup and peanut butter, spray measuring cups with cooking oil for easier removal.